Always keep Nori dry. This is important because Nori loses its taste once it becomes wet. The ideal way to store Nori is to carefully wrap in aluminum foil and refrigerate. Stored this way, Nori can keep its flavor for up to three years. How you cook Nori (dried seaweed), makes a big difference in the way it tastes. The best way to cook Nori is to toast it until it turns a rich beautiful green and begins to give off its unique aroma. To toast, place two sheets of Nori together as though you were making a sandwich. Make sure that the coarse sides face the outside. This helps preserve the flavor. With tongs, hold the Nori sheets over a low flame on a gas burner. Turn over several times . 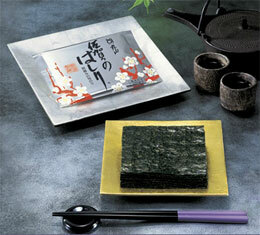 For electric stoves, Nori can be placed in a frying pan over high heat. Nori should be toasted on both sides Please use extreme caution not to overheat. Before toasting, dried seaweed has a water content of about 5% and has a chewy texture which makes it difficult to eat. When the water content is reduced to about 3% by toasting, it becomes more flavorful and the crispy texture makes it easier to eat.